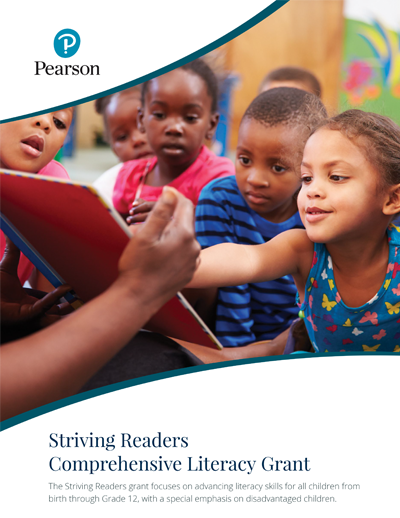 The Striving Readers Comprehensive Literacy grant is focused on advancing literacy skills for students from birth through Grade 12, including children living in poverty, English learners and children with disabilities. Distribution of funds: Eleven states have been awarded the latest round of Striving Readers funds: Georgia, Kansas, Kentucky, Louisiana, Maryland, Minnesota, Montana, New Mexico, North Dakota, Ohio and Oklahoma. States will hold grant competitions among local education agencies. Fifteen percent of the funds will target birth to age five, forty percent will go toward elementary, and forty percent will focus on Grades 6-12. Louisiana grant applicants must prioritize the use of approved Tier 1 ELA curriculum and curriculum-based professional development. From Pearson, that includes Opening the World of Learning for PreK and myPerspectives for grades 6-12. Download our FREE Striving Readers Grant Planning Guide.